While the U.S. Transhumanist Party has generally exercised great restraint in the criticism of conventional political figures such as Donald Trump, a hard line must be drawn at violations of basic human liberties, dignity, and decency. The open, cosmopolitan world which transhumanism requires has no place for bigotry and irrational detainment of individuals – entirely peaceful travelers with no possible connection to terrorism – on the sole basis of national origin, religious affiliation, or skin color. Donald Trump’s Executive Order on Immigration contravenes the ideals of transhumanism and directly impedes their realization. 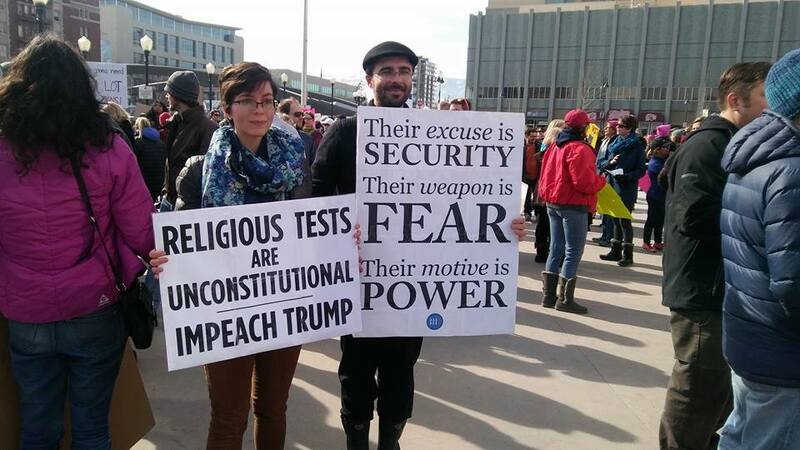 Scientists, university students, intellectuals, and other peaceful, productive persons who could have contributed to the realization of a future of technological abundance, have already been arbitrarily detained and subjected to humiliating conditions due to an unconstitutional, ex post facto executive order which has been enacted by an autocratic Executive Branch in defiance of multiple court-ordered stays. 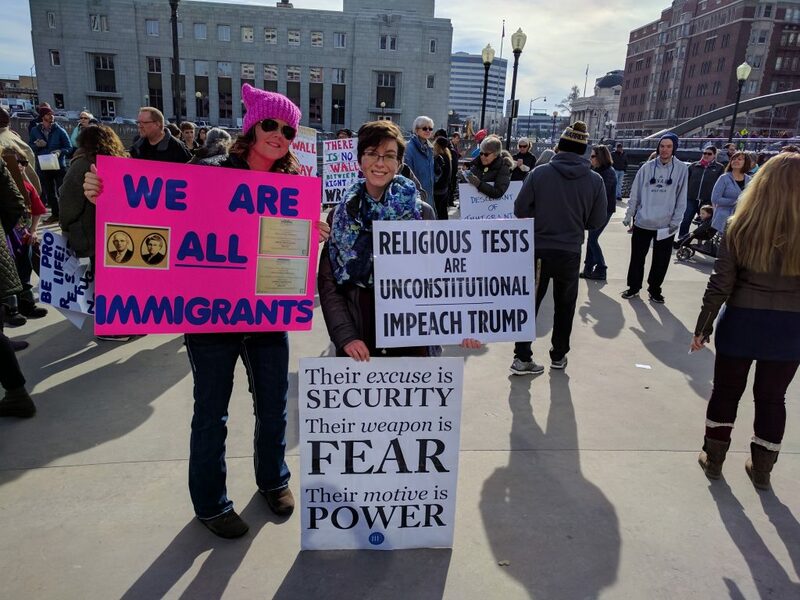 Numerous renowned academics, including winners of the Nobel Prize and Breakthrough Prize who have contributed key advances to biomedical sciences, have condemned the Executive Order on Immigration precisely for the reason that it will thwart scientific progress and punish many meritorious individuals. 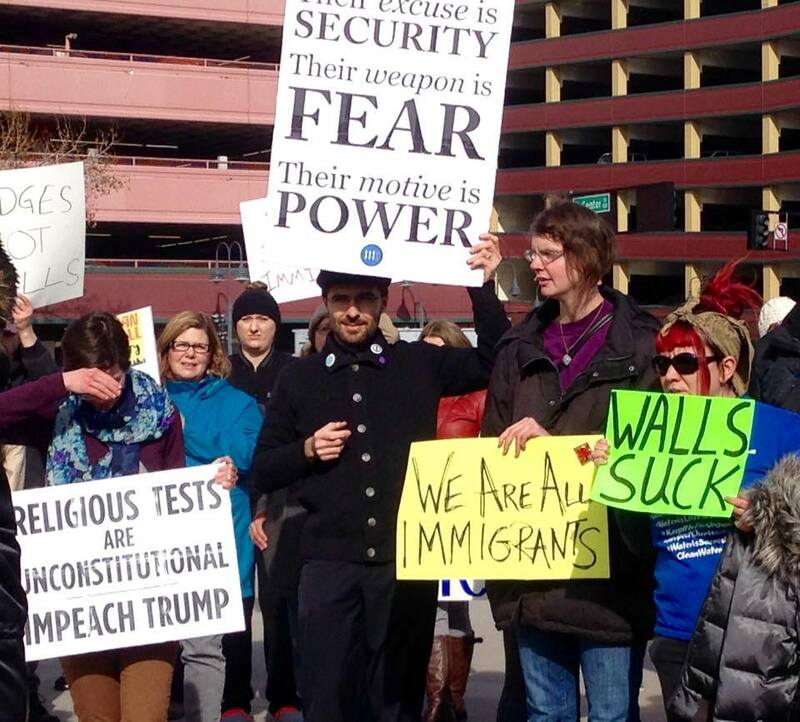 As a result of this extra-legal detainment and deportations, in defiance of multiple court orders, of entirely legal immigrants, U.S. permanent residents, and even certain U.S. citizens, the U.S. Transhumanist Party is obligated by its own principles and member-adopted statements to condemn the egregious violations of both the United States Constitution and of basic, universal human rights by the Donald Trump administration. The Transhumanist Bill of Rights – Version 2.0, adopted by the members of the U.S. Transhumanist Party, in Article XXV, extends to all sentient entities the protections of the United Nations Universal Declaration of Human Rights. 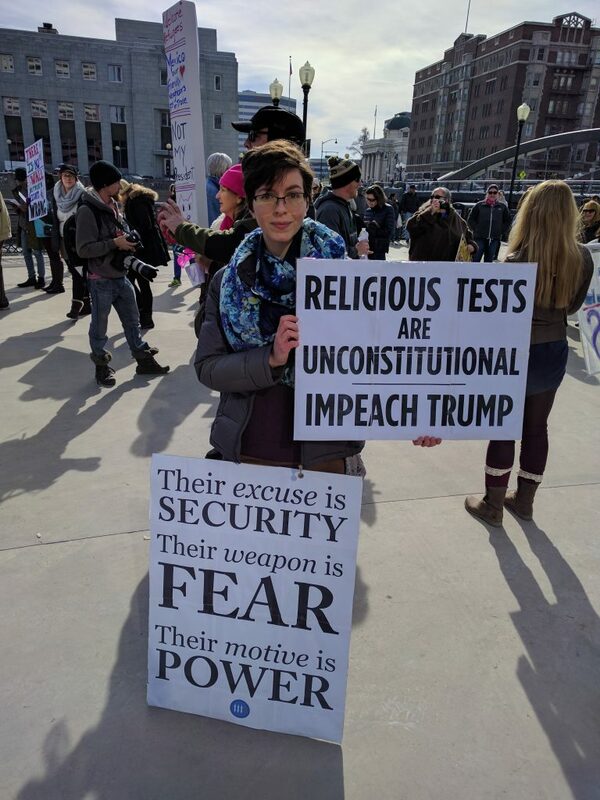 Surely these protections for sentient entities encompass peaceful travelers to the United States, as well as permanent residents and U.S. citizens irrespective of national origin. Article 9 of the Universal Declaration of Human Rights states that “No one shall be subjected to arbitrary arrest, detention or exile.” Furthermore, Article 11, Section 2, states that “No one shall be held guilty of any penal offence on account of any act or omission which did not constitute a penal offence, under national or international law, at the time when it was committed. Nor shall a heavier penalty be imposed than the one that was applicable at the time the penal offence was committed.” Travelers currently detained at U.S. airports are being held in arbitrary detention, and they are being deprived of liberty and of precious hours and days of their lives for acts that did not constitute any manner of penal offense. Their visas, green cards, and U.S. passports were entirely valid and legally recognized when they boarded their flights. Not only on the basis of transhumanist principles, but on the basis of universal human rights which have been recognized since the Age of Enlightenment, the actions of the Trump Administrations and U.S. Customs and Border Enforcement are contrary to the progress of humanity and transhumanity and decidedly on the wrong side of history. To be silent regarding the ongoing travesties now would risk future allegations of indifference to a great evil that is unfolding. 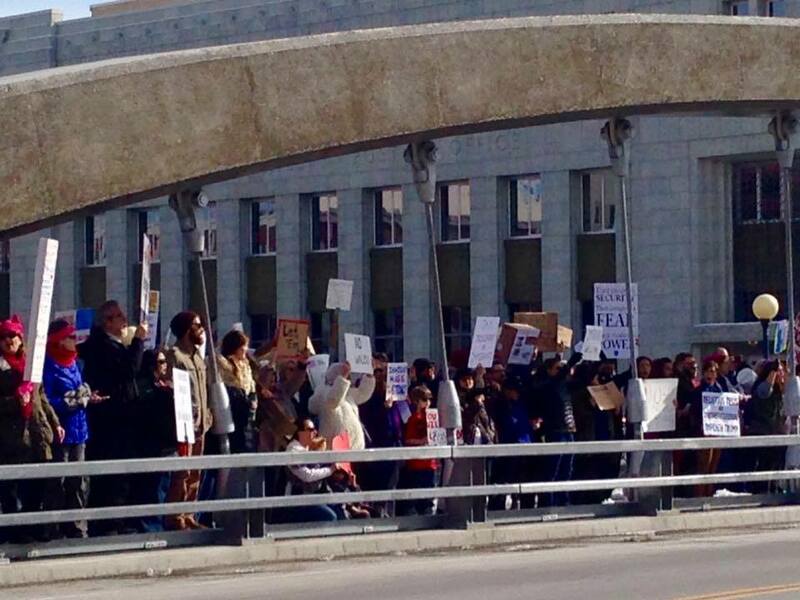 Therefore, on January 29, 2017, Chairman Gennady Stolyarov II and Secretary/Treasurer Wendy Stolyarov, participated in the Bridges, Not Walls protest in Reno, Nevada, adding their voices to a diverse gathering of over 500 individuals in an entirely peaceful and remarkably orderly demonstration which received overwhelming support from the residents of Reno in the vicinity. 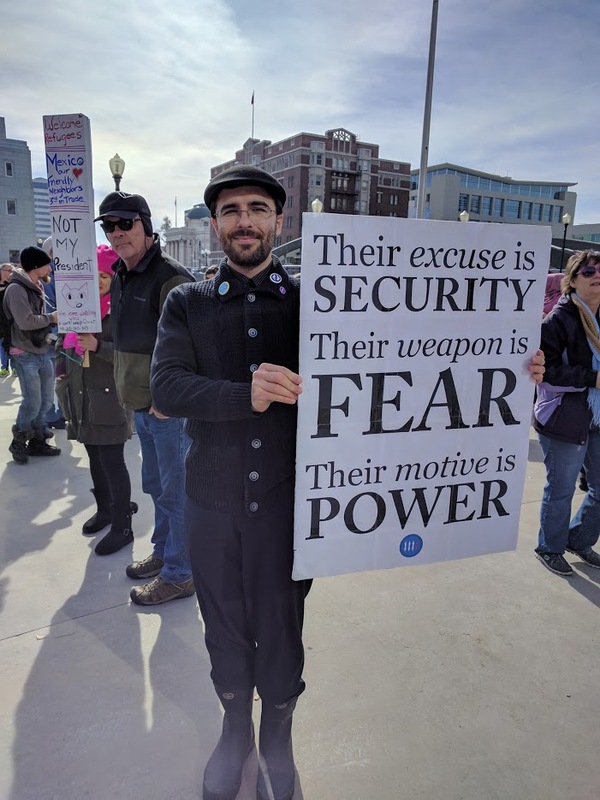 In the photographs below, you will see Mr. Stolyarov, wearing “Supporter of Indefinite Life Extension” and “No Hate” pins while he holds posters warning of the true motives of those who use the excuse of “security” to ruin the lives of peaceful, innocuous individuals. Who knows what great innovators in the field of life extension might be prevented from coming to the United States due to Trump’s Executive Order on Immigration? Let the potential innovators in!